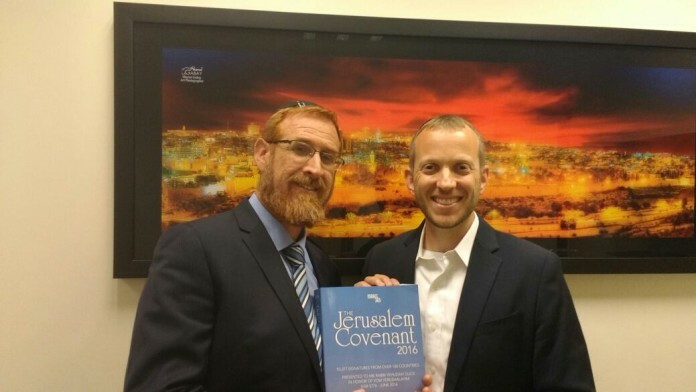 In honor of Jerusalem Day, a collection of more than 93,000 signatures from around the world reaffirming the “Jerusalem Covenant” was presented to Member of Knesset Rabbi Yehuda Glick (Likud) for his efforts to reconnect the Jewish people with the Har Habayis, despite Glick supporting visiting the Har Habayis in contravention of the p’sak of the greatest poskim, who forbid ascending the Har Habayis. Jerusalem Covenant, which proclaims the eternal unity of Jerusalem and its status as the biblical and political capital of Israel, was originally written in 1992 to commemorate the 25th anniversary of Jerusalem’s reunification during the 1967 Six-Day War. In 2013, Israel365—an organization that “promotes the beauty and religious significance of Israel to friends and supporters around the world”—launched a project to garner signatures reaffirming the Jerusalem Covenant.